Confetti pictures are the best. It's almost like rejecting gravity by capturing the suspension of coloured bits of paper in the air which.. will never come down again! I don't mean literally but you know, in some dimension. 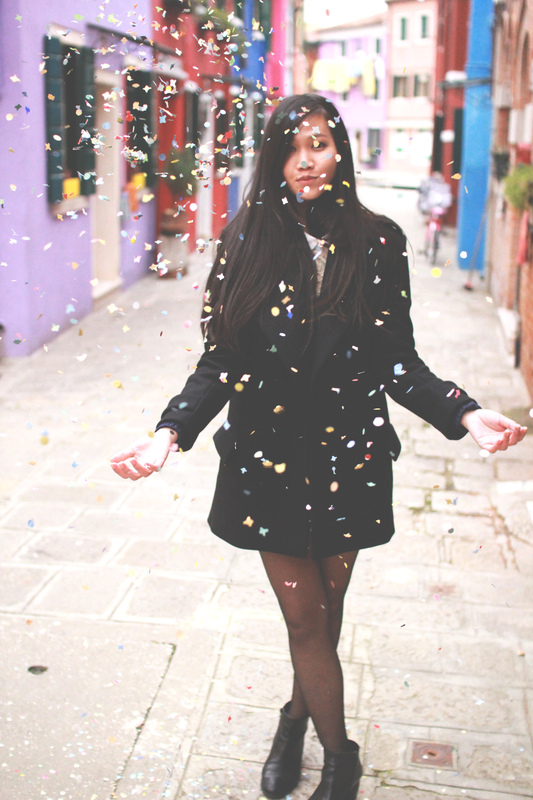 It's making something so temporal and fleeting permanent, which makes confetti photos just ethereal and pure magic.. But I thought I'd do a post on how incredibly hard these confetti pictures were to take, because it was just hilarious the lengths we went to. Some confetti photos are completely spontaneous and natural, like wedding confetti photos. The crowning of the bride and groom as they emerge from the church, with the sky raining with patterned papers. Then there's the staged confetti photos, like these. After this post you'd probably laugh when you see other pretentious confetti photos, and you are WELCOME. Well since this is my blog, I usually pick the photos which I feel I look best in, or captures the moment. This is a rare post that I'll include pictures that make me look mentally challenged. So it begins with an early morning in Venice, the second day of Carnevale 2013. It's beautiful weather as J and I attempt to wander from Dorsoduro to San Marco Square for the parade, and we chance upon a few children playing in a pile of confetti. They were having all sorts of fun blowing it and jumping around in it, so I naturally decided to join in. Harmless as it seemed at that time, my days in Venice were about to be monopolized by the desire to capture the perfect confetti picture..
As per pictures above, blowing handfuls of confetti didn't quite work out, so I tried tossing it. I'm not entirely proud of how many pictures I made J take of me flinging little bits of paper in the air while I looked like I was worshipping in some evengelical church or asking for rain, but after awhile I decided I wanted my own bag of confetti (and J wanted breakfast). There are some things you can't share for too long without feeling bad. 1) Not so quiet or deserted. Turns out we were right outside a daycare center. 2) The Confetti : Person Ratio is almost impossible to maintain..
3) One bag of confetti doesn't last long. 4) Jump + Confetti = Impossible??? I hope you've all had a good laugh at how ridiculous the photo process was. I shall leave you with a better visual than the one above, and wish you all the best in your hipster-confetti-picture endeavors! !